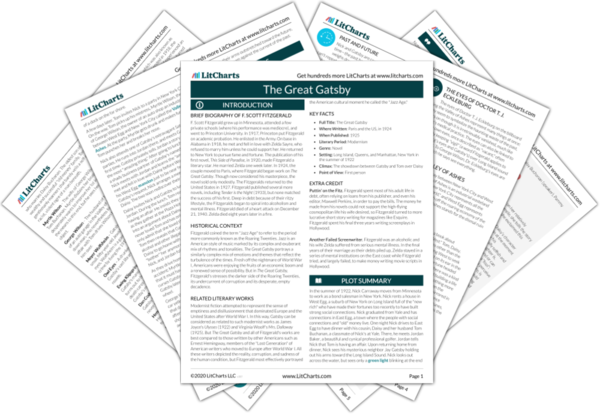 Instant downloads of all 945 LitChart PDFs (including The Great Gatsby). 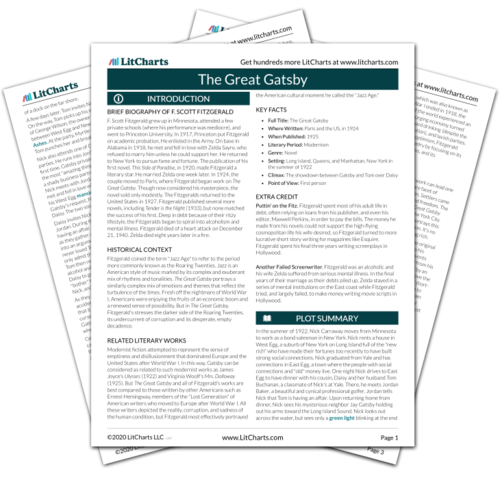 Welcome to the LitCharts study guide on F. Scott Fitzgerald's The Great Gatsby. Created by the original team behind SparkNotes, LitCharts are the world's best literature guides. A concise biography of F. Scott Fitzgerald plus historical and literary context for The Great Gatsby. A quick-reference summary: The Great Gatsby on a single page. In-depth summary and analysis of every chapter of The Great Gatsby. Visual theme-tracking, too. Explanations, analysis, and visualizations of The Great Gatsby's themes. The Great Gatsby's important quotes, sortable by theme, character, or chapter. Description, analysis, and timelines for The Great Gatsby's characters. Explanations of The Great Gatsby's symbols, and tracking of where they appear. An interactive data visualization of The Great Gatsby's plot and themes. F. Scott Fitzgerald grew up in Minnesota, attended a few private schools (where his performance was mediocre), and went to Princeton University. In 1917, Princeton put Fitzgerald on academic probation. He enlisted in the Army. On base in Alabama in 1918, he met and fell in love with Zelda Sayre, who refused to marry him unless he could support her. He returned to New York to pursue fame and fortune. The publication of his first novel, This Side of Paradise, in 1920, made Fitzgerald a literary star. He married Zelda one week later. In 1924, the couple moved to Paris, where Fitzgerald began work on The Great Gatsby. Though now considered his masterpiece, the novel sold only modestly. The Fitzgeralds returned to the United States in 1927. Fitzgerald published several more novels, including Tender is the Night (1933), but none matched the success of his first. Deep in debt because of their ritzy lifestyle, the Fitzgeralds began to spiral into alcoholism and mental illness. Fitzgerald died of a heart attack on December 21, 1940. Zelda died eight years later in a fire. 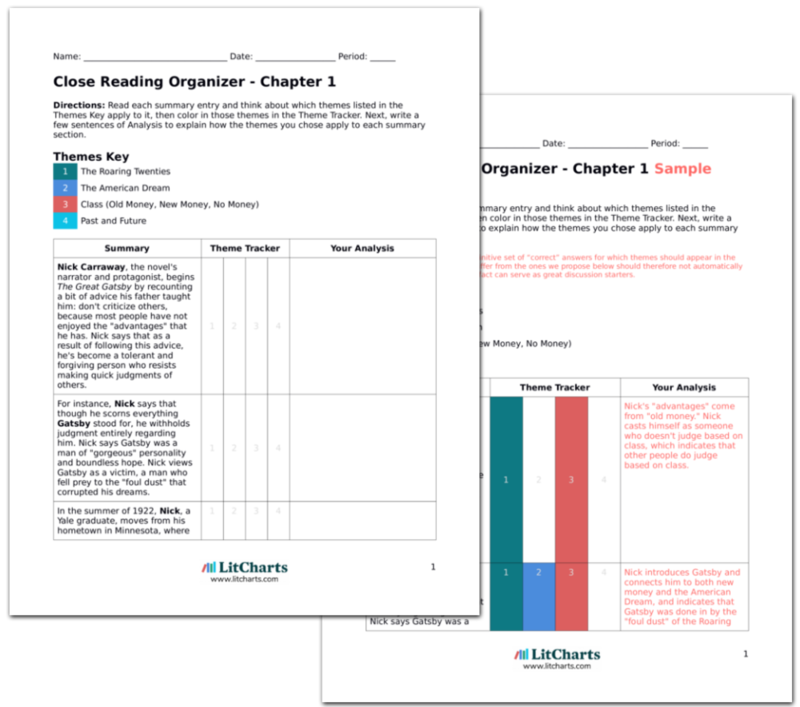 Get the entire The Great Gatsby LitChart as a printable PDF. Fitzgerald coined the term "Jazz Age" to refer to the period more commonly known as the Roaring Twenties. Jazz is an American style of music marked by its complex and exuberant mix of rhythms and tonalities. The Great Gatsby portrays a similarly complex mix of emotions and themes that reflect the turbulence of the times. Fresh off the nightmare of World War I, Americans were enjoying the fruits of an economic boom and a renewed sense of possibility. But in The Great Gatsby, Fitzgerald's stresses the darker side of the Roaring Twenties, its undercurrent of corruption and its desperate, empty decadence. Modernist fiction attempted to represent the sense of emptiness and disillusionment that dominated Europe and the United States after World War I. In this way, Gatsby can be considered as related to such modernist works as James Joyce's Ulysses (1922) and Virginia Woolf's Mrs. Dalloway (1925). But The Great Gatsby and all of Fitzgerald's works are best compared to those written by other Americans such as Ernest Hemingway, members of the "Lost Generation" of American writers who moved to Europe after World War I. All these writers depicted the reality, corruption, and sadness of the human condition, but Fitzgerald most effectively portrayed the American cultural moment he called the "Jazz Age." Puttin' on the Fitz. Fitzgerald spent most of his adult life in debt, often relying on loans from his publisher, and even his editor, Maxwell Perkins, in order to pay the bills. The money he made from his novels could not support the high-flying cosmopolitan life his wife desired, so Fitzgerald turned to more lucrative short story writing for magazines like Esquire. Fitzgerald spent his final three years writing screenplays in Hollywood. Another Failed Screenwriter. Fitzgerald was an alcoholic and his wife Zelda suffered from serious mental illness. In the final years of their marriage as their debts piled up, Zelda stayed in a series of mental institutions on the East coast while Fitzgerald tried, and largely failed, to make money writing movie scripts in Hollywood. Kestler, Justin. "The Great Gatsby." LitCharts. LitCharts LLC, 22 Jul 2013. Web. 21 Feb 2019. Kestler, Justin. "The Great Gatsby." LitCharts LLC, July 22, 2013. Retrieved February 21, 2019. https://www.litcharts.com/lit/the-great-gatsby.